As Christian traditions became prevalent in western Europe, greenery was kept as part of the celebrations, but ascribed new religious meanings. If you’re curious why today we decorate the Christmas tree, or how mistletoe became the excuse to steal kisses, and what new plants have been gaining popularity as Christmas plants lately, now is the time to make yourself a nice cup of tea and scroll through the gallery of Christmas plants we’ve assembled. The quintessential holiday herb, rosemary is as classic as the Christmas tree. Its association with Christmas dates back long before the poster child poinsettia had anything to do with it. Rosemary is believed to have been one of the plants in the manger where baby Jesus was cradled. In the Middle Ages, people believed that if they smelled rosemary on Christmas Eve, they would be healthy and happy throughout the new year, so they walked on rosemary spread across the floors, starting a tradition of rosemary in Christmas decorations that we continue today – with the tabletop rosemary Christmas trees, wreaths, festive swags, and evergreen bouquets. Keep your rosemary bush for Christmas fresh by pruning it according to schedule. Make sure to mist the herb afterward. Keep it near a direct source of light (either next to a sunlit window or outside under full sun). In order for the plant to survive until Christmas, water it regularly, even though it’s drought tolerant. 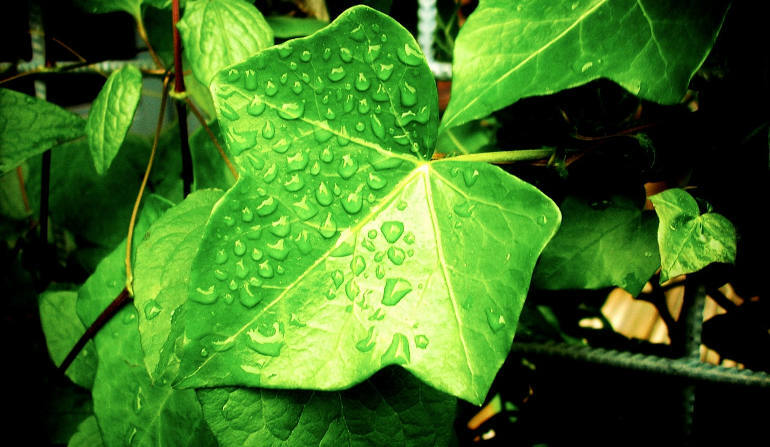 Water once every 7 to 14 days, since you won’t be able to know from its leaves – they don’t wilt at all. Repot at some point or plant outside until the next Christmas comes. Shape the rosemary from spring, through summer and autumn, and when cold winds come, bring it indoors again. Repot again in a larger pot for improved water retention with good drainage potting soil mix. The Druids considered holly to be a sacred plant and attributed magical powers to its red berries and prickly thorns. Holly was a symbol of eternal life and fertility and they believed that hanging the plant in homes would bring good luck and protection. Christians continued the holy tradition from Druid, Celtic and Roman traditions, changing its symbolism to reflect Christian beliefs. Today, holly is symbolic of Jesus Christ in two ways: its red berries represent the blood that Jesus shed on the cross and the pointed leaves refer to the crown of thorns Jesus wore when he died on the cross. After you plant the holy, water every day for the first seven days, then lower down to twice a week. After establishment, the bush will need roughly 2 inches of water at a minimum every week. Fertilizing should happen once a year. Holly bush must be pruned often so that it doesn’t block air by itself. Don’t cut too much from it when it’s time to make the Christmas decorations. An extra bush will help minimise the cuts from a single one. And, most importantly, weed often. Again, thank the Druids for the tradition of hanging mistletoe. Like the holly, it was believed to possess mystical powers and bring good luck to the household. In Norse mythology, mistletoe was a sign of love and friendship and that’s where probably the custom of kissing under mistletoe originated. Although during the first Christmas celebrated in Western Europe, some tried to ban the use of mistletoe as a decoration in churches, many people still continued to use it in their festive decorations. The tradition of kissing under the mistletoe originated in England. A berry was picked from the sprig of mistletoe before the person could be kissed and when there were no more berries left, there could be no more kissing! Mistletoe loves brisk weather – so keep the plant outside, in a shed or in your garage. If the leaves look dry, spray with some cool water. As heat inside your house will worsen its condition, keep mistletoe in a cold area for as long as possible. By any means, let it stay away from your dinner – it’s poisonous and can be harmful to kids and pets if ingested. Seek a medical service from a certified doctor if such an event happen. Mistletoe also gets sticky – wash your hands after touching it. The use of ivy during winter goes back thousands of years. Ivy stayed green throughout the year, prompting some to believe it had magical properties and leading to its use as home decor in the winter months. Like the holly, it also symbolised eternal life and rebirth and was used to decorate homes and churches, as early as the 15th and 16th centuries. With its tendency to cling, ivy was the symbol of marriage and friendship in some cultures, and in Christianity it represents the need to cling to God for support. Leave the ivy pot in a place where it will get at least four hours of direct sunlight. Fertilise once a month and keep the potting mix moist. Cool temperature will keep ivy alive for longer. Repot when the plant overcrowds its original pot. Make the ivy more bushy by pinching off the tips of its stems. Native to Central America, the poinsettia became widely known thanks to of a man called Joel Roberts Poinsett, hence the name, who introduced the plant from Mexico to the US in 1825. An old Mexican legend intertwines poinsettias and Christmas, telling the story of a poor girl who had no present to give to baby Jesus on Christmas Eve, so she made a small bouquet of weeds. As she put the bouquet at the nativity scene, it bloomed with bright red flowers, convincing everyone who saw it they’d witnessed a miracle. Since that day, the bright red flowers became known as the ‘Flores de Noche Buena’, or ‘Flowers of the Holy Night’. Nowadays, poinsettias with their festive colours, are one of the most popular Christmas plants to display or give as a present to friends and family. Keep the room temperature at around 20 C during the day and colder at night. Place poinsettia in a sunny windowsill that faces south, or leave a bright filtered light nearby. If the windowpane gets cold, make sure the leaves do not come in contact with it, as it will damage them. Don’t worry if poinsettia’s leaves turn yellow, the plant is adapting to the new conditions and slowly will resume its colour. Similar to the poinsettia, with the Christmas rose it’s another story about a girl who had no gift for the Christ child. According to legend, Christmas roses sprang from the tears of a young shepherd girl who was weeping with sadness after searching in vain for a Christmas flower to give to baby Jesus in Bethleem. A Christmas rose will bloom in the darkest and coldest months of the year, producing flowers from late autumn until early spring. Oh, and it’s not actually a rose – technically, it’s a hellebore. Keep Christmas roses long lasting by repotting into a bigger plastic pot once a year during mid- to late-August. Add a fertiliser with a slow release effect when you repot the plant. Finally, move the hellebores back to a warm wall in the late autumn. Australia has been using the indigenous Christmas bell as festive decorations since the early 19th century. Blooming during the Christmas season with bell-like flowers, varying from pure yellow to deep red with yellow tips, Christmas bells are a favourite addition to many festive tables and decors during the Christmas celebrations in Australia. Keep their roots cool and weeds away if you grow Christmas bells directly in the ground by mulching. Make sure the soil is also well-drained. Due to its deep rooting system, Christmas bells must be grown in a large and deep pot, too, and even this won’t be enough to avoid repotting them every 2 years or so. Grow them in full sun or partial shade. Frost will not do any damage to the plant. 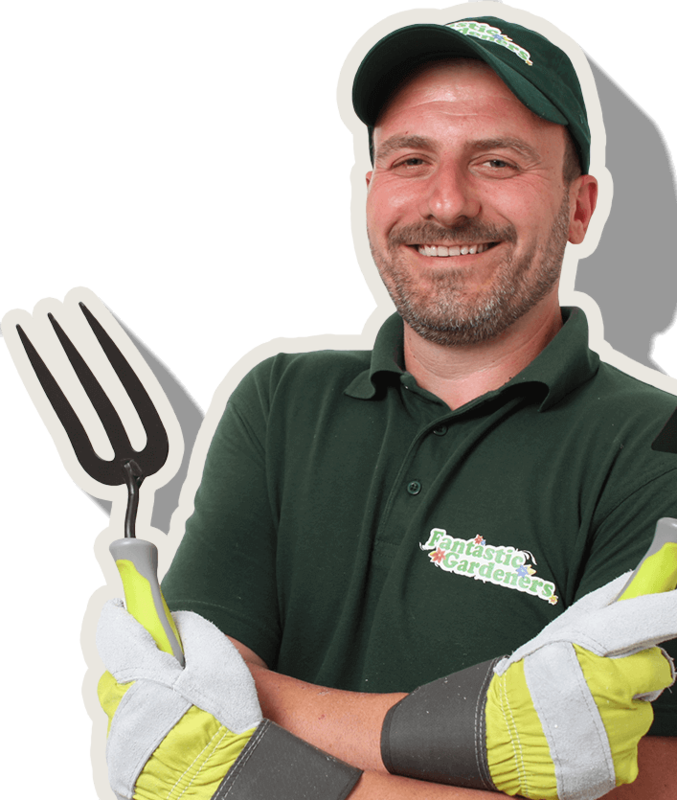 Use a slow-release fertiliser in late summer. Water the Christmas bells regularly – especially during the initial stages of growing in spring, they must be watered once every 2 days. Australians also decorate their houses with bunches of ‘Christmas Bush’, a native Australian tree with small green leaves. The heavily flowered dark pink blooms turn into star-shaped deep red flowers over a period of weeks, generally by the week of Christmas in Sydney. Grow the plant in sun or half-shade spot. For maximum flowering results, plant the bush under full sun. Well-drained, crumbly and moist soil is a requirement. Pruning the Christmas bush after flowering will allow it to remain dense and in good shape. 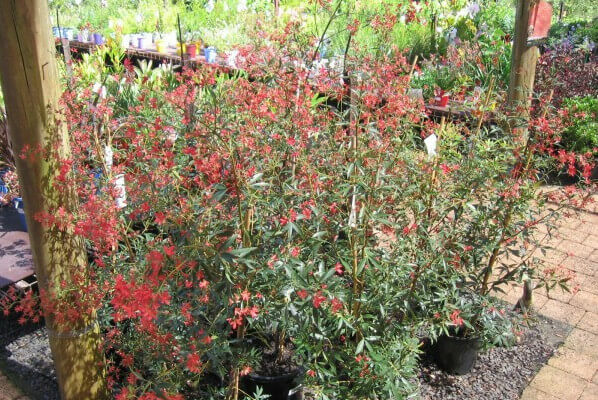 Feed the Christmas bush when it starts growing with a native fertiliser. Although evergreen fir tree has traditionally been used to celebrate winter festivals for thousands of years, the pivotal Christmas tree is a relatively modern addition to British Christmas traditions. Bringing a tree inside and decorating it in the way we know today first happened in 16th-century Germany, and became popular elsewhere in the 19th century. The first Christmas trees came to Britain sometime in the 1830s and became very popular almost a decade later, when Queen Victoria and her German husband Albert had a Christmas tree set up in Windsor Castle. If labeled as a pot-grown tree, its odds to stay alive until next Christmas season will be higher. Keep the tree in a cool place and water it plenty – depending on the size, the Christmas tree can take up between 2 and 8 pints of water for one day. Adjust your Christmas tree to the outer conditions after the holidays by moving it to a greenhouse or on the porch. Once spring comes, repot in a larger pot. It’s not a safe bet that amaryllis will be replacing poinsettias as the Christmas plant any time soon but for most gardeners (and not only) their huge blooms are an essential part of Christmas celebration every year. The massive, six-pointed amaryllis bloom makes an impressive festive decoration at the backdrop of a bleak day. 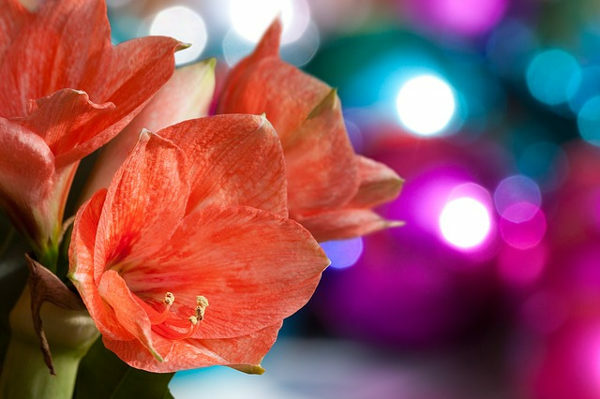 If you want to have a blooming amaryllis for Christmas, you should plant the bulbs no later than the beginning of November, although it’s always safer to just buy one already in bloom. Cut the stalk to 1 inch of the top of its bulb after fading. Feed with a liquid fertiliser and water timely. Amaryllis will grow leaves during the warmer seasons. Gradually decrease the amount of water towards middle of August, so that the foliage dies and the bulb remains dormant. Increase watering exponentially together with the plant’s growth. After a month and a half, the plant will blossom abundantly again. Apart from flowering over the Christmas period, the Christmas cactus has nothing to do with either the Christmas tradition or the story of Christ’s birth. Its common name is derived only from its ability to flower during the Christmas season. Christmas cacti are long-lived and easier to maintain than their more popular Christmas counterparts – the poinsettias. 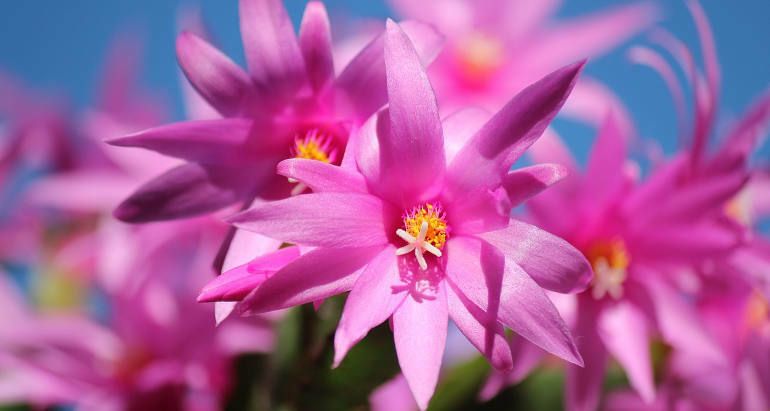 The Christmas cactus loves a combination of light and dark environment in Autumn. Try to keep a schedule of roughly 12 hours per day for each of the cycles. After buds come out, stop the light and dark exposure. Once buds engorge, the cactus is ready for display – but mind it shouldn’t be in a dry or too heated an environment. Continue feeding and watering while the cactus blooms and grows. We know it’s not exactly a plant specie, but before Christmas trees became popular in the UK, there was another form of evergreen Christmas decoration. Dating back to the Middle Ages, the kissing bough (or kissing bunch) was hung in houses to bring blessings to the family. Originally, kissing boughs were made of five wooden hoops in the shape of a sphere and decorated with holly, ivy, rosemary, bay, fir or other evergreen plants. Red apples were hung Inside the hoops, and a candle was either put inside the ball at the bottom or round a horizontal hoop. A large bunch of mistletoe hung from the bottom of the sphere gave the bough the final touch. Did we miss anything? Do you know other popular Christmas plants? Let us know in the comments below or give us a shout on social media!